An attractive, large clumping plant which is native to moist areas and stream beds from Baja California north to San Luis Obispo. This sedge, if given the optimum conditions of full sun and ample water can reach 4-5 ft. tall. The leaves are a rich bluish green when planted in full shade, tending to silvery gray in sunnier conditions. In the spring the yellow flower spikes emerge above the leaves and age to tan during the summer. Plant in full sun or shade (where foliage color is richer) and in or out of water. 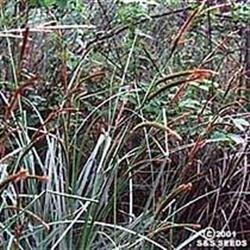 This sedge can withstand considerable dryness once established. This sedge looks somewhat like a cattail. It produces angled stems surrounded by leathery green to reddish leaves. The inflorescence is up to 6" long, with many long reddish brown flower spikes, each holding up to 300 developing fruits.